Our riders are the best part about Biki and we love to hear your stories. 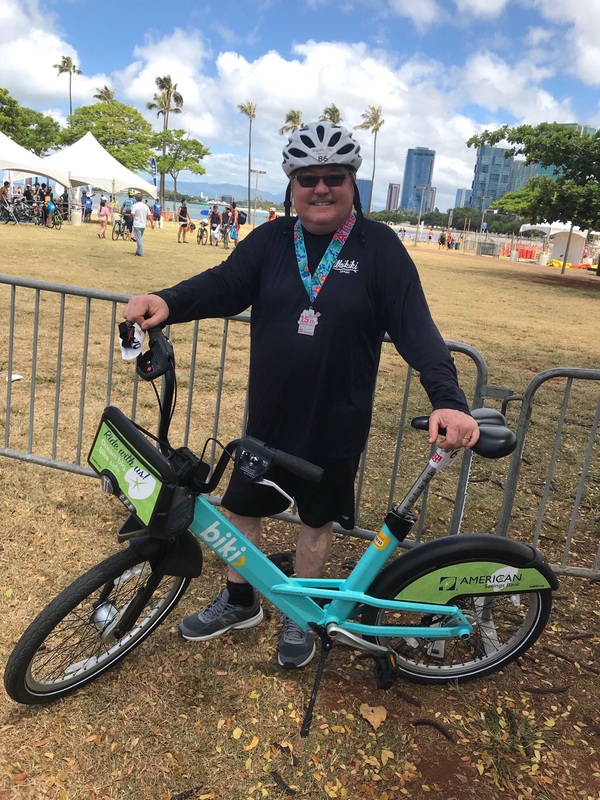 We recently received this story from Richard Campbell, a first-time rider who participated in the Honolulu Olympic Triathlon and completed the bike portion on a Biki! I had a heart transplant in April 2017 and signed up for the Honolulu Olympic Triathlon event to give me something to aim for. A few months back, side effects from a medication change made training and fitness difficult. My wife competes so we of course still made the trip to Hawaii, and I planned to swim myself back into shape in that wonderful ocean. Since we are from the Seattle area, I went with the credit card auto upgrade plan but will certainly use the monthly plan next time around. Rode over to IT&B for a helmet and was all set to rock and roll. I switched to the sprint tri so that I would be comfortable with my decision. My assigned "86" race number was an omen as I was not about to be 86'd out of the race! I nicknamed the bike the 'Aqua Blue' and it worked like a charm, as far as a well maintained, three speed, city bike, with a built in head wind goes for triathlon use! I got many cheers and compliments on the course from participants, and police alike. The camera lady missed my first picture as she did not realize I was actually in the race, but made a quick recovery. I did have a funny interaction with two riders who were facing a headwind. I had dropped my water bottle, slowed down, but decided to let it go. The two riders caught up with me yelled out. "We finally caught him!" to which I replied that I was happy I could help them maintain their high standards! Someone has to be the carrot! The previous night before the race, I woke up at 2AM wondering if all the bikes were going to be taken and that I should go get one.I checked out the availability on the Biki App and found I was sitting pretty and there were plenty of bikes all around. Great App, easy to use. The "Biki" concept is well run and seamless from the user stand point. I was impressed with the availability and ease of use. What I find important is what a "Biki" bike can do for all avenues. It works so well for the tourist out for a ride, where you see so many more things on the that beautiful Island, a quick commute, or even a grocery run so not to deal with vehicles or parking. Then there is just going out for the exercise and clearing one's mind, and of course 'triathlons'! Participating in the Honolulu Triathlon amid the quick recovery was the highlight of my trip. Encouraged by my wife Carol, who has the Kona Ironman notched on her Bib Strap, I have done a few events, including a few Kona Honu 70.3’s. It is all about the freedom, fitness, travel, goals, camaraderie, accomplishment, excitement, and even the finish line. But, it is so much more about the journey. Overcoming the obstacles that will present themselves all along the way, and it is where the most satisfaction will be garnered, where the most frustration will attempt to take you down, and where you get to look back and say “Yes!” and then you look to the future and do it all again... and say “Yes!” again and again. Because, my friend... it is all in the journey, the paths taken, the roads not followed, all the things the poets and writers give us insights about, to go along with what we all get to experience on our own. These events are my way to advocate for organ donation, quietly on the side, but with a powerful voice and example. Have a Biki story you want to share? We'd love to hear from you! 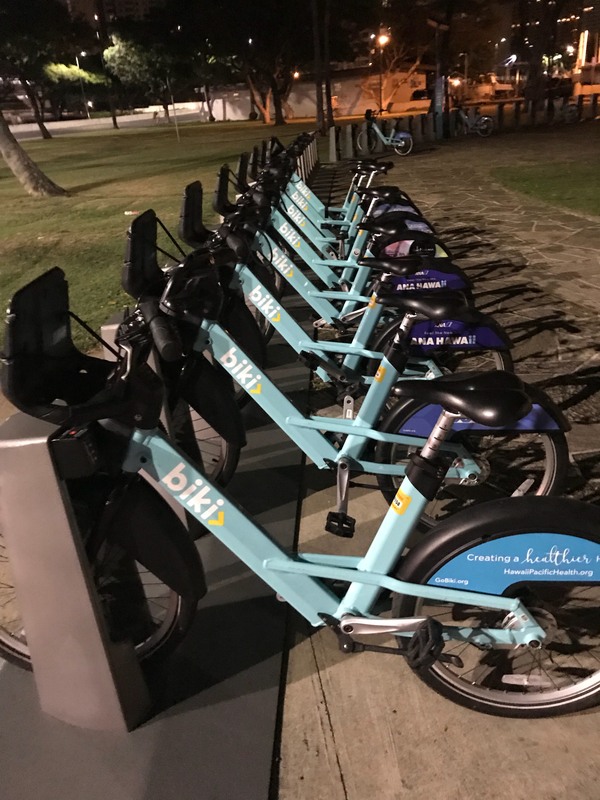 Contact us at info@bikesharehawaii.org.